Welcome to the biodynamic research portal! Here you can filter, sort, and search a collection of biodynamic research reference citations from around the world. They include long-term biodynamic research trial results, journal articles, books, conference proceedings, reports from innovative organizations, and more. Both peer-reviewed and non-peer-reviewed documents are included. Links are given for the full text where publically available. (Please note that we don't have access to the text of all articles. In some cases a link is provided to the relevant academic journal's website). Many more biodynamic-related research references exist than are currently in this database. We are continually adding references as time and resources allow. If you have additions to suggest, please email them to sarah@biodynamics.com. To filter for research articles in the Biodynamics journal, type "biodynamics" in the "Journal Name" box. To download citations click the orange "CSV" button at bottom right of the list. 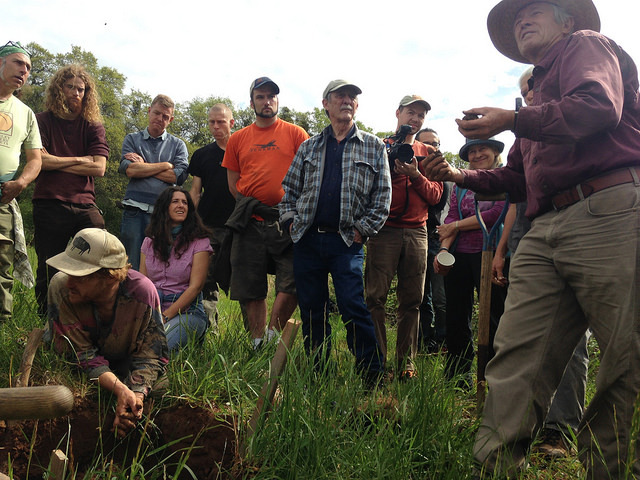 To connect with others about research, visit the Biodynamic Research discussion forum. More references can be found by searching Organic EPrints, Biodynamic-Research.net, Google Scholar and other websites. References from the earlier literature can be found in the Literature Cited section of Spiritual Foundations for the Renewal of Agriculture (Creeger-Gardner translation 1993). Alfӧldi, T., Mader, P., Besson, J. M., & Niggli, U.. (1995). DOK-trial: Long-term effects of bio-dynamic, bio-organic and conventional farming systems on soil conditions, yield and product quality. 1st Meeting on Fertilization Systems in Organic Farming. Darmstadt. Arunkumar, J. (2011). Utilization of alternative herbs and materials for the production of biodynamic manures and their efficacy on growth of selected plants. University of Madras. Bachinger, J. (1996). The effects of different types of fertilization (mineral, organic, biodynamic) on the temporal dynamics and spacial distribution of chemical and microbiological parameters of C and N dynamics in the soil and also of crop and root growth of winter rye (No. Research Report Volume 7). (German Language) (p. 166 pp.). Darmstadt, Germany: (German Language) Institute for Biodynamic Research. Brinton, W. (1983). Report on testing bio-dynamic preparations 500 & 507. Biodynamics, (148), 11-24. Brinton, W. (1986). Investigations Concerning Preparation 500. Biodynamics, (157), 44-52. Coderey, P. (2009). Sensitive Crystallizations. Biodynamics, (270), 36-37. Eldridge, M., Kirchoff, B., & Richter, S.. (2005). An Experimental Test of the Biodynamic Plant Peppers. Biodynamics, (254), 30-33. Eldridge, M., Kirchoff, B., & Richter, S.. (2006). A further test of the biodynamic plant peppers. Biodynamics, (255), 37-40. Endelman, J., Gardner, M., Brinkley, J., Courtney, H., Via, W., & Wickert, B.. (2014). Nitrogen dynamics of biodynamic horn manure. Biodynamics, (282), 38-43. Endelman, J. (2010). The Valerian Preparation: Correlating Sensory Experience and Physicochemical Properties. Biodynamics, (271), 28-34. The Biodynamic Association awakens and enlivens co-creative relationships between humans and the earth, transforming the practice and culture of agriculture to renew the vitality of the earth, the integrity of our food, and the health and wholeness of our communities.